Help ARS and the Tim Tebow Foundation Today! Help the Tim Tebow Foundation by typing "Tebow" in the comment box when you schedule your appointment! Click HERE or call 800-ARS-9400! Be sure to type "Tebow" in the comment box or mention Tim Tebow when scheduling! $10 off* any scheduled repair or service call, and $10 will be donated to the Tim Tebow Foundation™. 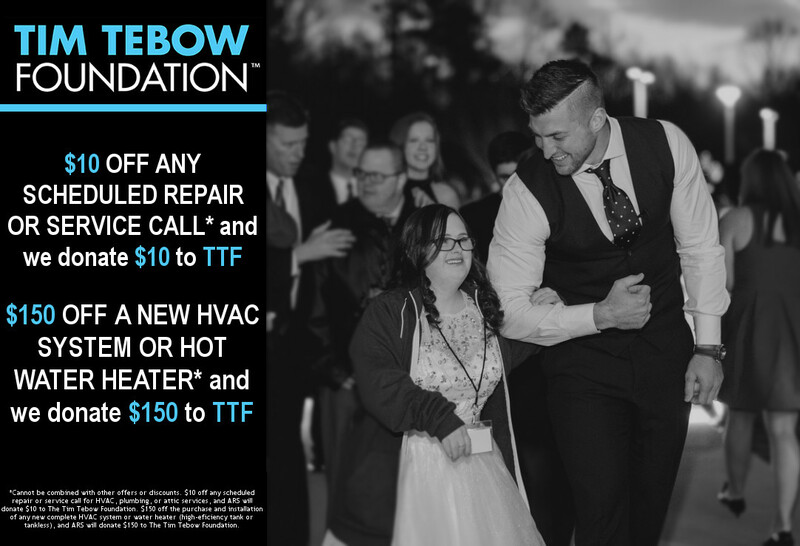 $150 off* the purchase and installation of a new complete HVAC system or water heater (high-efficiency tank or tankless), and $150 will be donated to the Tim Tebow Foundation™. American Residential Services has a proud history with Tim Tebow. Since 2010, ARS became the platinum sponsor for the Tim Tebow Foundation™ (TTF) annual Celebrity Gala and Golf Classic. The Golf Classic serves as the signature fundraising event for the foundation and raised over $2.2 million in 2018. ARS/Rescue Rooter is honored to be in its second year as the Global Partner for TTF’s worldwide event, Night to Shine - an unforgettable prom night experience for children with special needs. Night to Shine is an unforgettable prom night experience for children with special needs. See how you can be involved HERE. For a limited time, if you mention Tim Tebow when scheduling a service on the phone or use the promo code "Tebow" when scheduling on our website, you will receive a discount with a portion of the proceeds* going to the Tim Tebow Foundation™. If you have any HVAC or plumbing needs, ARS is here 24/7 to take your call and help make our world a better place. Call 800-ARS-9400 and mention Tim Tebow, or click HERE. Watch the Tim Tebow/ARS partnership video here! ABOUT AMERICAN RESIDENTIAL SERVICES: Based in Memphis, Tenn., privately-owned ARS operates a network of more than 70 locally-managed service centers in 23 states, with approximately 6,500 employees. The ARS Network features industry-leading brands including, A.J. Perri, Aksarben ARS, Allgood, Andy’s Statewide, ARS, Aspen Air Conditioning, Atlas Trillo, Beutler, Blue Dot, Bob Hamilton, Brothers, Columbus Worthington Air, Comfort Heating & Air, Conway Services, Efficient Attic Systems (EAS), Florida Home Air Conditioning, Green Star Home Services, Irish Plumber, McCarthy Services, Rescue Rooter / Proserv, Rescue Rooter, RighTime Home Services, RS Andrews, The Irish Plumber, Unique Services, "Will" Fix It, and Yes! Air Conditioning and Plumbing. As an Exceptional Service Provider, the ARS Network serves both residential and light commercial customers by providing heating, cooling, indoor air quality, plumbing, drain cleaning, sewer line, radiant barrier, insulation and ventilation services. Each location has a knowledgeable team of trained specialists. ARS requires background checks and drug tests on all employees. We hire professionals with the highest level of integrity. Providing exceptional service and ensuring the highest standards of quality, ARS has the experience to do any job right – the first time, with all work fully guaranteed. ARS: "Making it work. Making it right. *Cannot be combined with other offers or discounts. $10 off any scheduled repair or service call for HVAC, plumbing, or attic services, and ARS will donate $10 to The Tim Tebow Foundation. $150 off the purchase and installation of any new complete HVAC system or water heater (high-eficiency tank or tankless), and ARS will donate $150 to The Tim Tebow Foundation.